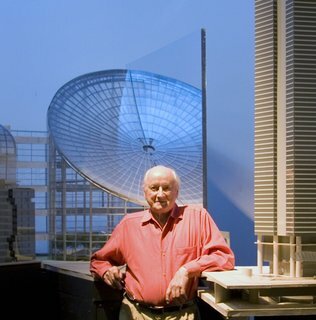 Pritzker Prize-winning architect Kevin Roche passed away on March 1 at the age of 96. We look at the cultural institutions he designed that carry on his legacy. The favored architect of the Metropolitan Museum of Art, Kevin Roche redefined the design of corporate, urban headquarters, welcoming in light and life and banishing parking lots to the bowels of buildings. Following his death at 96 on March 1, we look back on his work. Roche's practical approach to his craft defied characterization. When he won the Pritkzer Architecture Prize in 1982, the jury noted that outwardly, his work had little in common. However, the Dublin–born architect and protégée of Eero Saarinen saw his work as finding solutions to problems rather than simply creating attractive shapes. Eamonn Kevin Roche believed design began with need, a principle that permeated his career. The modernist architect, who began practicing in New York in 1950, is responsible for many iconic structures in the city, including the Ford Foundation headquarters, the United Nations Plaza, the Central Park Zoo, and the Museum of Jewish Heritage. He also created the master plan for The Met’s expansion, beginning in the mid-’70s. Roche arrived in the United States in 1948 and became the right-hand man of Eero Saarinen, who was emerging as one of the world's leading architects, by 1954. Following Saarinen’s death, he continued his mentor’s work on the IBM Pavillion at the 1964 New York World’s Fair, completed JFK Airport’s TWA Terminal (which has recently been reinvented as a hotel), and entered a competition to design a new museum in Oakland. That project's innovative, cascading concrete terrace and garden concept launched his career and hinted at two of his most valuable contributions to modern office buildings—putting parking underneath and embracing nature in a sea of concrete and steel. The Oakland Museum in California was one of Roche's first independent projects in his adopted country. 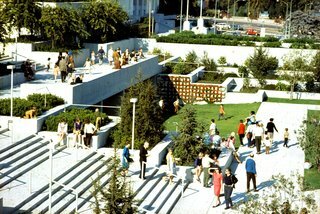 Completed in 1968, the Oakland Museum occupies four blocks and was conceived as a walled garden with large, welcoming entrances. The galleries are arranged so that the roof of one becomes the terrace of another, wide walls surrounding the greenery at just the right height to sit on; and since the building was finished, the plantings have enveloped the entire building, submerging its form and creating a lush, colorful garden. Roche took the concepts he employed at the museum back to New York and began to change the shape of the modern American office building. He designed 38 institutional and corporate headquarters and eight museums in a career that encompassed 200 buildings throughout the United States, Europe, India, and Asia. Here is a look at a few of his creations. In keeping with Roche’s ethos of creating solutions to problems, this midtown Manhattan office building rejected conventions of the time for building higher and taller. Instead, this 12-story office, stretching the width of the block between 42nd and 43rd Streets, was an early example of an open-plan office where employees weren’t trapped in cubicles. 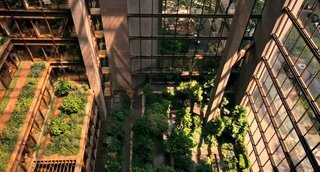 The Ford Foundation building was completed in 1967, one of the first by Roche's new firm—Kevin Roche John Dinkeloo and Associates. The design incorporates an atrium garden by landscape architect Dan Kiley. "Kevin endeavored to create a building that captured the aspirations of the foundation’s social justice mission," wrote the Foundation’s president Darren Walker, in a tribute to Roche. And he succeeded. New York Times architecture critic Ada Louise Huxtable called the transparent structure of glass, granite, and Cor-Ten steel "that rarity, a building aware of its world, as well as a work of art." Built in 1989, this project involved the challenge of creating a tower that was technologically and functionally contemporary. 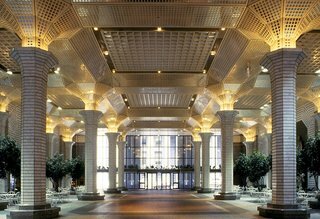 State-of-the-art communication systems, energy efficiency, and readiness for the coming wave of computerized offices were the directives for the J.P Morgan headquarters—yet the structure needed to feel part of the mix of 19th- and 20th-century buildings on Wall Street. The J. P. Morgan Bank Headquarters on Wall Street in Manhattan. 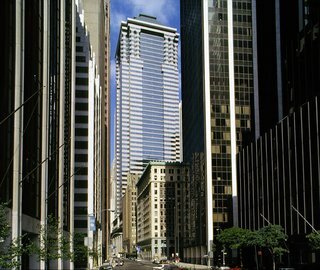 Roche employed 70-foot-high columns to line both streets, anchoring the base of the 51-story skyscraper while also decorating its upper facade, paying homage to the classical architecture of neighboring 55 Wall Street. A distinctive urban space at street level is a half-acre covered, landscaped, public indoor park, that spans three stories. Offering an escape from the financial district’s claustrophobic streets, the park boasts fountains, trees, flowers, waterfalls, cafes, and kiosks. The interior of the J.P Morgan building. Beginning in the late ’70s, Roche’s firm Kevin Roche John Dinkeloo and Associates created a master plan for the phased expansion of the United Nations site that encompassed three buildings—two 40-story towers and a third of 15 stories to serve as headquarters for UNICEF. The iconic lobby at Ambassador Grill has been designated a New York City landmark. But it was to be the interior of the United Nations Plaza Ambassador Grill and Lounge (now the One UN New York Hotel), personally designed by Roche and Dinkleoo, that captured the most attention. New York Times architectural critic Paul Goldberger described it as the "most sensuous piece of modern design in a public place in New York since the Four Seasons was finished in 1958." This modern, mirrored masterpiece, designed during the height of New York’s Studio 54 era, created the illusion of high ceilings and natural light where there were none. Recently, the Landmarks Preservation Commission made it New York City’s 118th interior landmark. Roche’s lasting legacy in New York, however, is undoubtedly the master plan he created for New York’s Metropolitan Museum of Art. Beginning in 1967, he dedicated four decades to designing what is now recognized as one of the world's greatest museums. 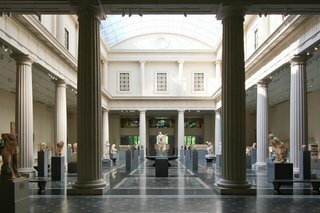 Roche's redesign of the Greek and Roman Court at The Met was unveiled in 2007. Roche has left us with a space to both celebrate the past and look to the future, redesigning the space in front of the museum, creating an urban plaza that has showcased many celebrities as they attend the Met Gala, and illuminating the interior of this grand museum with a glass pavilion. Skylights drench the artwork in natural light, and sloping glass walls provide visitors with views of Central Park. 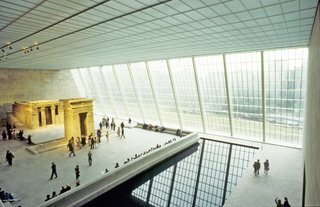 Roche created a "display case" for the Met's treasured Temple of Dendur, an Egyptian temple built in 15 B.C. during the reign of Caesar Augustus.